The show was a blast. One audience member brought her teddy bear named Cuddles to the show.Turns out she’s a straight Christian who lives her spiritual politics. Of course, the bear brought up plushy references from me in the show which then brought out a furry to me after the show (who pronouced Cookie “The hottest, funniest show I’ve ever seen.”). That’s some diversity! 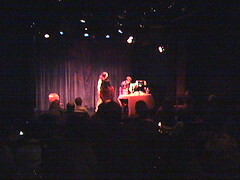 Sadly the video didn’t record of this show, but I just found this camera photo on flickr. Here I am baking with Lisa Kron (at Ars Nova in NYC) who was just nominated for a Tony for her play Well. Lisa is a real inspiration for mye as a solo performer (especially her work with the Lesbian Brothers) and she told a lot of great stories that night, including one about licking the hamburger meat off her dad’s hands as a child when they cooked together. She remembers the taste of his wedding ring. I just got back from KUMC where I performed Cookie for a packed and enthusiastic audience. Here I’m dancing near the end of the show with a biochemistry professor who dipped me almost to the ground. This was part of their diversity presentations. There are no out GLBT students at the school and it is unconstitutional for queer folk to marry in Kansas. They continue, however, to be patents. Almost everyone in the room raised thier hand when I asked them if they knew anyone gay. Things are so so much better than the media makes you think. I told them I want to be watching “little channel of regular people” which is, I guess, what this b/vlog and the Net are becoming. But Kansas still does have it’s issues, like the fact that there;s a real debate over teaching evolution in the states schools. My host their told me that 70% of the Kansas population is in KC Lawrence and Wichita and it’s the 30% with more land in rural areas that have the political sway because of districting. I love baking Cookies for the red states.